“The idea for this painting came very naturally. My daughter, Brittany, is following in her parents footsteps and is quite the artist at 14.” (Morgan’s wife, Jo Ann, paints under the name J. Peralta). “She has posed for me many times, notably in The Dance. 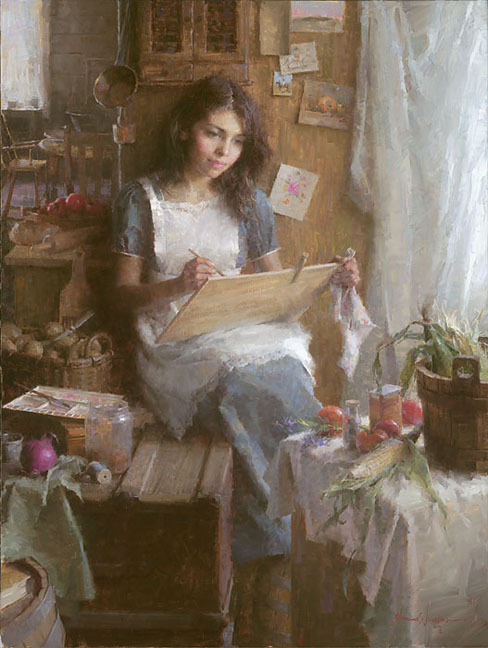 Here, she is a girl set with kitchen tasks but has set them aside to partake in her first love, painting. Although she should be peeling those potatoes, she would rather set up items from her mother's 1890s country kitchen and paint a still life in watercolor. Behind her on the cabinet, other paintings are pinned. I tried to portray that intensity of young inspiration to be an artist. It's an unstoppable force when given the right encouragement.